When I started writing my first romantic suspense Beneath the Skin, I had no plans to make it into a series. But it didn’t take long for me to start imagining the lives of the secondary characters and wondering if they could win true love too. So when I pitched the book to Rhonda Penders at Wild Rose Press, I told her it was the first of a series of four books – The Skin Quartet. 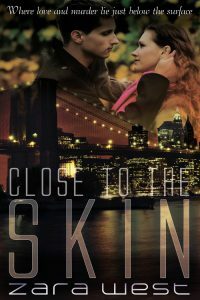 Well, on August 18th, book 2 in the series Close to the Skin is scheduled to be released. Now I will find out if I have accomplished what I set out to do. To write a successful series, the author needs to accomplish 6 things. This one was a real challenge. No one wants to read a series where characters’ eye color and other characteristics flip around. But I tried a lot of other methods as well. The results of what I learned are presented in my online workshop The Story Bible. (Note: I will be offering this workshop for From the Heart Romance Writers in September 2018). Another important thing I learned was to keep all my data together. I originally had separate files for each book. This meant I was constantly moving from one to the other. I quickly learned that the best organizational method is to keep all the data for the entire series in one series file. Having a great Story Bible means that I can quickly locate a name or an age or a location or hair color. But it needs to be supplemented with a calendar. In my case, my series books are consecutive. That means that characters grow older in each book. Not by much -all together the span is about four years. But when one main character is only 14 in the first book, four years will make big difference in his life. FOUR – Maintain the tone and conflict level. I wanted to keep the same tone and page-turning level of excitement that reviewers praised after reading Beneath the Skin. Since each book in the Skin Quartet deals with different characters who relate on different emotional levels., this one was a particular challenge. You want the characters to be unique but linked in some way even though time is passing and the characters are growing, maturing and changing. In my case, I solved this problem by keeping the villains the same in each book. Because they change much less and are driven to the same end goal – tormenting the hero and heroine, they provide a unity of motivation and consistency of character. FIVE – Make the books stand on their own. Despite the fact that I was writing a series, I wanted to make sure that every book in the series could be read as a stand-alone. I hate picking up a book and not knowing what the author is referring to. In a recent poll I did on Facebook, every single commenter said they would not like to read book 2 in a series before book 1. However I have seen it done successfully. But boy is it hard to do well. A series writer has several choices. You can summarize what has already happened near the start of the story. But that often slows down the reader and can prove annoying. You can give a few hints of past events and hope the reader will understand enough. You can tie the past events into the current characters’ lives as motivations or problems. For Book 2 in The Skin Quartet, I have my main character suffering from post-traumatic stress following the kidnapping she experiences in book 1 Beneath the Skin. For me, having each book follow the next in time was another great way to ensure the stories stand on their own. A NetGalley reviewer has written that Close to the Skin works as a stand-alone. I hope other readers agree. SIX End with a happily ever after. Having been burned by several books which end in a cliffhanger, I was doubly motivated to make sure every book in my series had a happily ever after. I decided that the best approach was to write a complete character arc for my romance couple. At the end of the book, their story is done – ending happily ever after. Since Close to the Skin has not been released yet, I have my fingers crossed that I have succeeded in making both a great Book 2 full of characters my Beneath the Skin readers have come to love plus created a cast of characters who can stand on their own and draw a new reader in. Note: Book 3 in the series Within the Skin is currently in production at Wild Rose Press. How about you? Have you written a series? What did you struggle with? Are you a reader of series? What do you like about them? What do you dislike?